PEEPS Snack Mix is an irresistible mix of almond bark coated cereal, popcorn, pretzels, candy-coated chocolate candies and PEEPS, and is seriously addictive! 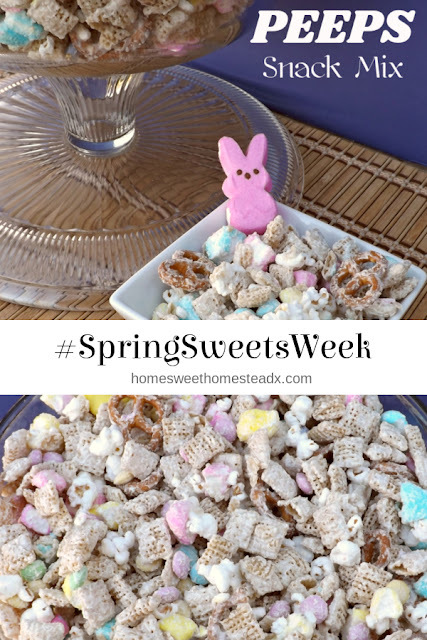 This post and recipe was created for #SpringSweetsWeek. I was sent samples by some of the sponsor companies, but as always opinions are 100% mine. To me, nothing says Spring has arrived more than one, the arrival of daffodils, and two, PEEPS® showing up on store shelves. Since both are now on the scene, I decided to welcome my favorite season, by adding those sugar coated puffs of marshmallow goodness to my favorite snack mix. 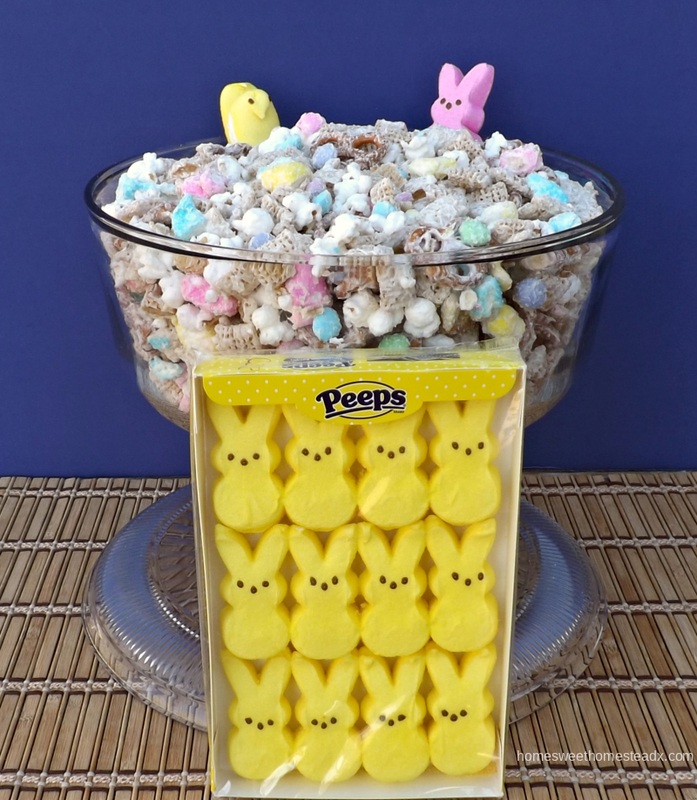 Say hello to the deliciously sweet and salty PEEPS Snack Mix! Welcome to my second post for #SpringSweetsWeek. This recipe is cute, colorful, sweet and salty, and ADDICTIVE! The combination of different textures from the cereal, popcorn, pretzels and PEEPS are amazing, and once you start, you wont be able to stop yourself from grabbing "just one more handful" again and again. 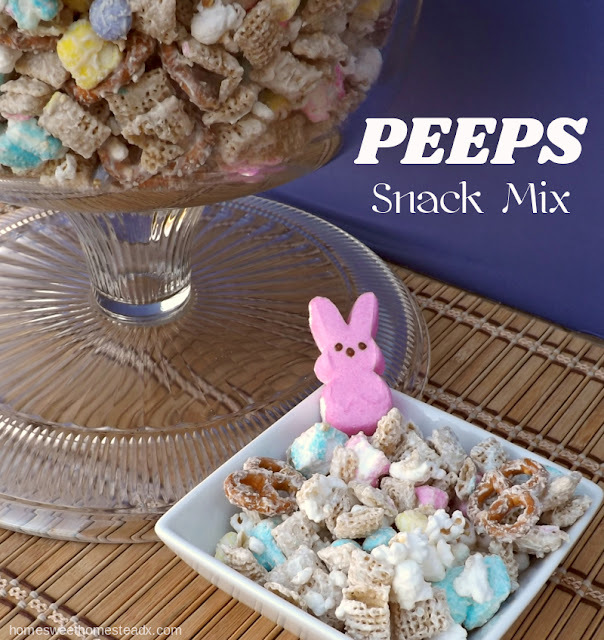 I hope you give this PEEPS Snack Mix a try. It's the perfect sweet and salty snack to share with family and friends on game day, movie night, or at your child's next sleepover. 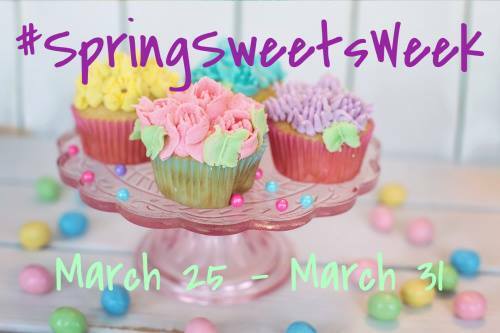 Don't forget to check out all of the other #SpringSweetsWeek recipes by fellow bloggers in the links below. And let me know in the comments which PEEPS are your favorite. Are you team #PEEPSChick or team #PEEPSBunny? Line a large rimmed baking sheet with a silicone baking mat or parchment paper. 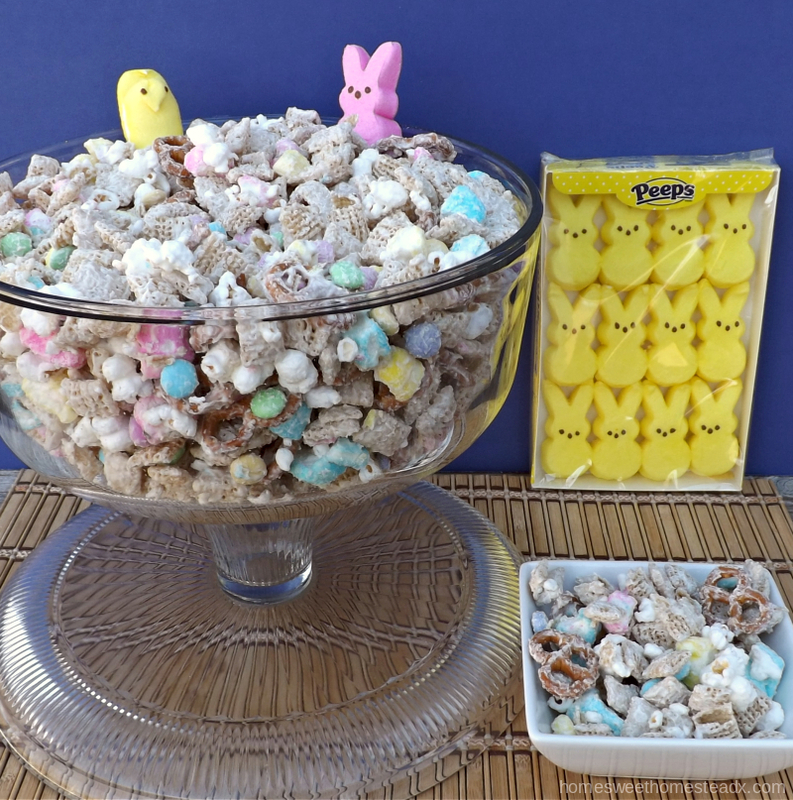 In a large bowl mix together cereal, popcorn, chopped Peeps, and pretzels. Set aside. Cut almond bark into small chunks and place in a microwave safe bowl. Microwave on High for 30 seconds, carefully remove bowl from microwave and stir. Continue heating in 30 second increments, stirring after each time, until smooth. Pour melted almond bark onto cereal mixture in batches (about 1/3 at a time) and fold in well with a rubber spatula. Continue until all of the almond bark has been mixed in. Carefully fold in candy-coated chocolate candies, and spread mixture onto prepared baking sheet. 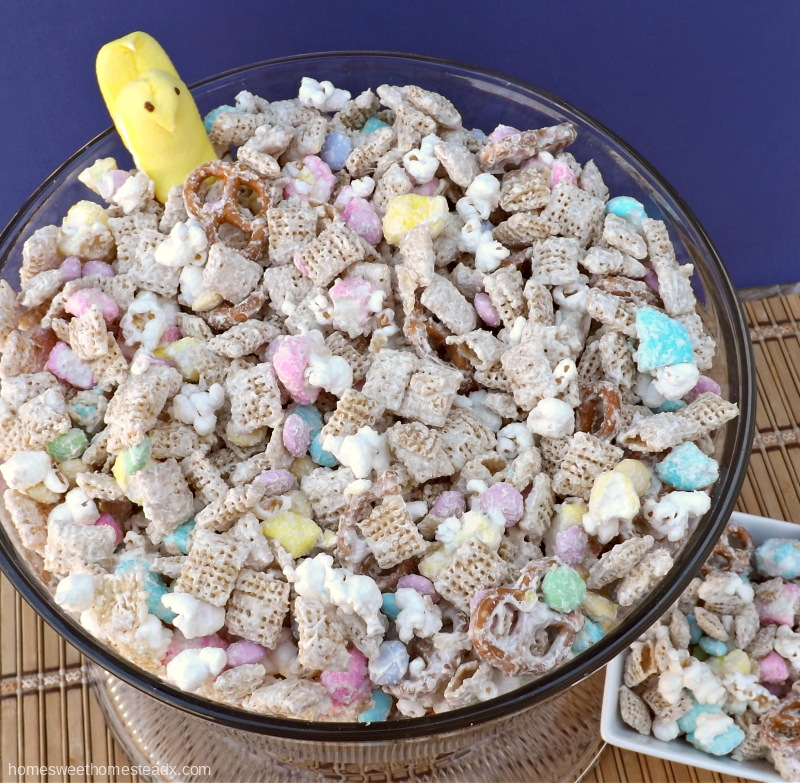 I made this PEEPS snack mix with pastel colored M&M's, so it is not dairy free. I just found out there is a dairy free version available called No Whey Choco No Nos. I couldn't find them in my area so I haven't tried them yet, but I plan on ordering some soon. 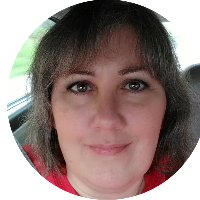 Don’t forget to enter to win one of 8 fabulous prizes! Did you make this recipe? Tag @xhomesweethomesteadx on Instagram and hashtag it #xhomesteadrecipesx, for a chance to be featured.